Cross-platform application Dropbox may be great at syncing regular old files and folders over the internet and to the web, but with a little ingenuity, you can use this free software to ensure important application data stays in sync no matter what computer you're using. With the right setup, you can sync your passwords over the internet so you've always got access to the latest versions of your secure passwords no matter where you are. Keep reading to find out how. I'm going to detail how this works with the open-source password manager, KeePass, and with the Mac-only manager, 1Password—the top two favourites in our recent Hive Five Best Password Managers. The set up is basically the same for both applications, so to get started, go download and install Dropbox on every computer you want to sync passwords to. Done? Now let's set up password syncing with KeePass. Now on any other subsequent computer, just open KeePass (or KeePassX for OS X or Linux users—which works just as well), select File -> Open Database, and point it to the synced KeePass database file that you added to your Dropbox folder. Assuming the step above went as planned, this file should already have synced to the Dropbox folder on all of the computers you want to sync passwords to. That's really all there is to it. Any time you edit or create a new password on one computer, it'll automatically sync to the other; all you need to know to access any of your passwords is one master password. There's a small catch here: KeePass doesn't automatically update your passwords when it's open, so if you make a change on one computer and then make a change on the other without re-opening the new database, you'll end up with a conflict. Dropbox handles conflicts well—that is, nothing will break and it alerts you of the conflict—but you may lose changes from one of your computers. 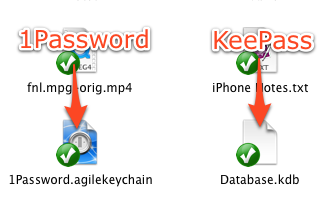 Syncing 1Password with Dropbox works very similarly to syncing KeePass. 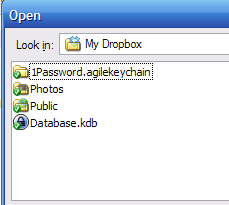 In a nutshell, you need to save your 1Password database file in your Dropbox directory. There are a couple of peculiarities that you'll need to make sure you've covered before proceeding, but the 1Password blog has detailed instructions for the whole process, so I won't re-tread that ground. What I will say is that 1Password works like a charm with Dropbox, since this password manager automatically detects any changes and updates your keychain the moment a change is made to the Agile Keychain file. That means you're much less likely to end up with any sort of conflicts or lost information. What Other Clever Ways Can I Sync Data with Dropbox? Password syncing really just scratches the surface of the clever ways you can use Dropbox to sync application data or share files. For example, XBMC-spinoff Boxee suggests using Dropbox to quickly share media files with your media center no matter what computer you're using. GeekTonic expands on this idea for SageTV users. What clever ways are you putting Dropbox to use? Let's hear about it in the comments. Opera is v good for it's sync of bookmarks etc. XP -> Win Mo -> lovely Linux.